Closed Saturday and Sunday during the summer. ramp, entrance to garage on right. From MERRITT PARKWAY take Route 25 south to Exit 1, turn left at bottom of ramp. Continue to Lafayette Blvd., turn left onto Lafayette Blvd., entrance to garage on right. Three blocks south of the Inter-modal Transportation Hub on State Street. Parking is free and includes spaces for visitors with disabilitiest. Located in the heart of the arts and entertainment district, the Housatonic Museum of Art is in walking distance to attractions, retailers, and restaurants in the city including The Barnum Museum, Downtown Cabaret Theater, The Arena at Harbor Yard, Ralph and Rich’s, Tiago, Funchal Café and Two Boots Pizza, to name a few. 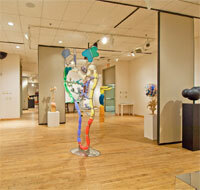 The Housatonic Museum of Art has one of the largest permanent collections of any two-year college in the Northeast. A reflection of Housatonic Community College’s philosophy is that art is a daily part of life for every student and staff member. Established in 1967 by art professor Burt Chernow, the Housatonic Museum of Art’s collection continues to grow and now contains over 4,000 works of art that span ancient through modern times. The permanent collection is displayed throughout the college campus, while the Burt Chernow Galleries offer changing exhibitions every 6 weeks featuring national, regional and local artists as well as the annual faculty and student art shows. On display throughout the College are portraits, landscapes, still-lifes, folk art and sculpture by such notable artists as Renoir, Matisse, Picasso, Miro, Chagall, Rodin, Avery, de Chirico, Christo, Klimt, and Rauschenburg, to name a few.